Mitsubishi Forward Collision Mitigation (FCM) is a radar-based autonomous emergency braking system. A single 77GHz radar is situated behind the front grille and is used to detect objects up to around 200m ahead which might present a risk of collision. The system operates up to a maximum speed of 180km/h. In the first stage, when the risk of collision is low, FCM issues a visual and audible warning to alert the driver to the threat. At the same time, the brakes are pre-filled and brake assist is activated, which boosts the braking pressure should the driver respond to the warning and apply the brakes. If the driver does not respond and the risk of collision increases, the system continues to warn the driver but also autonomously applies moderate braking, to begin to mitigate the severity of any collision but also to serve as an additional warning to the driver. 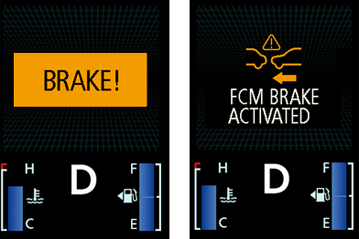 If the risk of collision escalates, FCM autonomously applies a high brake pressure to try to avoid the accident or to reduce its severity. Up to 30km/h, the system will apply a maximum deceleration of 8ms-2. Beyond that speed the maximum is 6ms-2. FCM is a system designed to help prevent rear-end collisions with vehicles which are stationary or travelling in the same direction. Several studies have shown that driver distraction or inattentiveness is a factor in most rear end accidents. The system is aimed at alerting the driver to an imminent rear end collision both at low speeds, typical of urban driving, and at higher speeds typical of rural roads and highways. In such accidents, the most common sorts of injuries are to the cervical spine, the soft tissue of the thorax and to the knees. By studying accident statistics in Germany and extending the figures to the broader European community, Mitsubishi estimates that, if all cars were fitted with FCM, some 12 percent of slight injuries, 3 percent of severe injuries and about 1 percent of fatalities could be prevented each year. FCM is switched on by default at the start of each journey. However, the system can be switched off by the driver by means of a dashboard mounted button. An independent Euro NCAP laboratory evaluated Mitsubishi’s FCM system. They found that the system worked as Mitsubishi had claimed. Collisions were avoided up to 30km/h with stationary vehicles and up to 60km/h with slower moving targets. Collision speeds were reduced in other tests. Extensive track testing was done by Mitsubishi during the development of FCM. A range of test scenarios were used to establish the effectiveness of the system at avoiding or mitigating accidents in a broad range of different situations. Mitsubishi also tested the system on the road to ensure that it operated only when needed and that false activations were minimised.